Spring Fling - Saturday, April 27th. Come bike in northern Ulster County. Greet old friends and bring along new. Scenic mountain vistas, waterfalls, and farms. Please arrive at least 15 minutes prior to the start of your ride. 12:30 am - Potluck lunch followed by club meeting. Please bring an appetizer, main dish or dessert to share. Drinks will be provided. Rain cancels. Any changes will be posted on April 27 by 7 am on the MHBC Facebook page and at www.midhudsonbicycleclub.com on the ride calendar. Parking is available behind the Church in the parking lot off of John St. Please enter the Church in the back from the parking lot. Cue sheets will be provided. Ride with GPS route links will be posted on the club calendar and on Facebook approximately 1 week prior to the Spring Fling. This is a special one! With inspiration from Cranksgiving rides that happen around the country, we’ve organized Poughkeepsie’s second annual Cranksgiving bike ride. Like all 8-ward rides, it’s a chance together with friends and neighbors in the City of Poughkeepsie. This time, there will be a handful of stops where group members can, if they desire, purchase nutritious food. The ride culminates in delivery of the collected food to Dutchess Outreach, where it will supply the Nourish Your Neighbor backpack program, benefiting Poughkeepsie City School District students on weekends, when they do not have access to free school meals. There will also be a post-ride wind-down at a local establishment – location TBD. Make sure to bring a backpack if you don’t have storage on your bike! Natalie Quinn, Sarah Salem and Evelina Knodel are taking lead on this, but if anyone wishes to be more involved or help be a group leader, please get in touch with them. It’s possible this ride will bring a lot of people out, necessitating separate groups. The more the merrier, but we could use some help with group leaders. 2018 Fall Round-Up and Pot Luck: Oct. 27 looks like a washout with rain and high wind being forecast. Remember Pot Luck and Business Meeting will still happen at the High Falls Fire House 12 noon. Share your favorite dish, tell your riding stories from this past summer and most important, vote for the 2019 Club Officers and Board Members. Come, enjoy and support the volunteers who make the MHBC function. Better yet; volunteer your talent and a little time. We need your help moving MHBC forward with our mission of promoting bicycle riding in our area. D: 16 miles (out and back) following the D & H Canal on backcountry roads. You can make this ride shorter if you want. Rail Trail: Flat terrain along the O & W Rail Trail. Mountain or Hybrid Bikes recommended. All rides leave at 10:00AM so get to the firehouse early to kit-up and sign-in. B, C+ and C rides begin at 9:00AM. The D ride will begin at 10:15AM. Rides will leave at the designated time, please ensure you arrive early enough to be ready to ride at the specific time. Lunch will be ready at 12:00PM. Please pick a route that allows you to be back at the start in time for lunch. After lunch there will be a MHBC meeting. This must be your first MHBC ride or you must be a current 2018 member. This year there will be a $5 fee to attend the Summer Picnic. We would appreciate it if members pre purchase on the website prior to the event. Pre purchasing gives us an idea of how many people will be attending and how much food to purchase. We will also be collecting money on the morning of the event. The B, C+, C, and D routes ride along beautiful country roads with views of the Gunks, orchards and horse farms. Most routes will pass the bird sanctuary. After the rides we will return to the park for a picnic lunch and board meeting. Any questions, please contact David Brody (631)-241-2349 or Jackie Broody (631)241-2350. Michael Peter is an adorable baby who just celebrated his first birthday on May 19th. Unfortunately, Michael had to have his birthday in Memorial Sloane Kettering Hospital in Manhattan as he is diagnosed with Stage IV Rabdomyosarcoma. He is currently undergoing intensive chemotherapy. We are looking to raise enough money to help his parents with the expense of traveling to the city, food, respite, and whatever other expenses they are incurring aside from astronomical medical bills. This is a private event and the parents are not aware that we are trying to do this for them, so please do not tell them if you know them. ALL MONEY COLLECTED WILL GO TO THE FAMILY. Our goal is to raise at least $1000.00 but we also hope to raise more than that number. 10 mile and 20 mile rides on the Dutchess Rail Trail. A 40 mile ride (self supported) will be mostly road with hills and some rail trail. 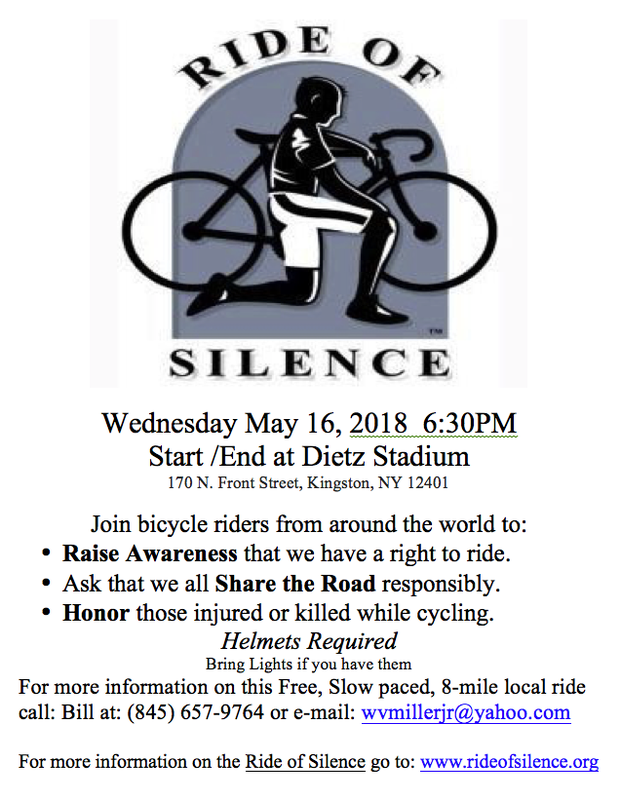 The Rail Trail will not be closed for this event and riders should be aware of other bikers and walkers who are using the trail that day. All riders need to wear helmets and follow the rules of the road. It is recommended that road riders have lights on their bikes. THIS IS NOT A RACE! Everyone starts at the Van Wyck Lane Parking lot of the rail trail between Lake Walton Road and Route 376. There will be 1st, 2nd and 3rd place prizes for those who raise the most money, donated by Hudson Valley Karate. Spring Fling - Saturday, April 28th. Rain cancels. Any changes will be posted on April 28 by 7 am on the MHBC Facebook page and at www.midhudsonbicycleclub.com on the ride calendar. Our insurance provider has advised us that for a ride to be considered a MHBC ride and covered by insurance, the ride information needs to be posted on the MHBC Ride Calendar, found at http://midhudsonbicycleclub.com/ride-calendar/ . Rides posted only on the Facebook group page are NOT covered by insurance. We encourage members to post on the MHBC Ride Calendar and the Facebook group. All members may post on the calendar. The password is changed annually and is emailed to you when you register. The Ride for Mental Health - Save the Date! Pease Join the MHBC for a bonus event we are hosting leaving from Tony Williams Park in Highland, NY on Saturday 9/23/17 at 9:00 AM! We will post routes in coming weeks. Cue sheets will be available. Following the rides we will be offering a delicious hot lunch at 12:30 PM. We will also be holding our September meeting at approximately the same time. Please join us for the event! Every year, the Dutchess County Transportation Council (DCTC) organizes volunteers to count people walking and bicycling at 30-35 locations around the county. The dates for this year’s counts are Tuesday September 12, Wednesday September 13, and Thursday September 14 (all 4-6 pm; the volunteer chooses which day to count), as well as Saturday, September 16 (12-2 pm). (Note that we try to count on ‘typical’ days, so we can change dates as needed to avoid community events). For more information on this program, see our Pedestrian & Bicycle Counts webpage. This year, I’m trying out an online sign-up sheet – that way we can all see what spots are still open. The Catskill Mountain Cycling Challenge carries forth the long tradition of recreational road cycling in the Western Catskills. Building on the Tour de Pepacton and the Ride-n-Peak, our 2017 Cycling Challenge brings you six routes (five of them new!) and includes a very challenging gravel grinder. Your scenic pedal will support new programming at the Catskill Recreation Center (CRC), being designed to encourage greater participation in recreation through incentive packages and more diverse programming. Erics ride fundraising still open! The MHBC has raised over $1500 for McLean Hospital with hopes of even more! Please share this link to help raise funds for a great cause. The Ride for Mental Healthis one of the first rides in the country to benefit mental health. The proceeds raised will be donated to McLean Hospital, a Harvard Medical School affiliate, for the education, research and treatment of mental illness including anxiety, borderline personality disorder, depression, eating disorders and substance abuse. Our mission is to raise funds for McLean so that we can help accelerate the progress being made to help others who suffer from mental illness. THE Ride for Mental Health is dedicated to the memory of a wonderful young man named Eric who died at 21 from mental illness. Join us Sunday, May 21st for the first ride of 2017 to benefit the NY Bicycling Coalition (NYBC.net). The Hudson Valley is home to many great rides and we are excited to offer a couple of our favorites! We also have the privilege of partnering with Kingston's own craft brewery, Keegan Ales!! The ride begins at Keegan's, with 22 mile and 48 mile route options. Both routes boast scenic rural views on the area's backcountry roads. The longer route option includes the very challenging climb on Dug Hill Road to the Ashokan Reservoir. Our host, Keegan Ales, will provide us with a place to launch our ride and return for refueling with food, rehydrating with some of the finest Mid Hudson brews and and the camaraderie of fellow cyclists! As you may know, NYBC is the only statewide bicycle advocacy group working to keep NY roads safe for all cyclists. For example, NYBC has been working tirelessly on trying to pass a 3 foot passing law in NY. This early-season ride is a way for us to meet other cyclists in our region, raise awareness of NYBC, membership and support, and to enjoy the sweet bounty of the Mid-Hudson Region. NEW!! A companion ticket has been added so folks can join their friends and partners for the after ride activities! As a rider, you receive guaranteed entry, fundraising guidance and incentives. All participants must agree to meet a fundraising minimum of $1,000. Narrows Bridge to Staten Island. Spots are reserved on a first-come, first-served basis. Spring Fling - Celebrate Earth Day! 12:30 am - Potluck lunch is with club meeting. Please bring an appetizer, main dish or dessert to share. Drinks will be provided. Rain cancels. Any changes will be posted on April 22 by 7 am on the MHBC Facebook page and at www.midhudsonbicycleclub.com on the ride calendar. Cue sheets will be provided. Over the years our club has purchased (with your dues) a good number of items to promote and enhance MHBC. Such as bicycle repair tools, ice coolers, a banner, etc. If you are in possession of any club property please compile an inventory list and forward to me or any other board member or officer. Our club secretary will maintain this list. Your assistance will be greatly appreciated.